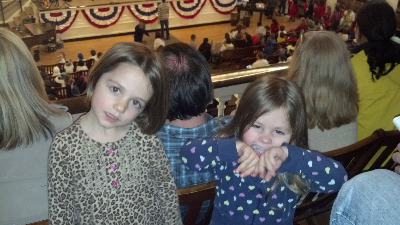 Rich's winter assembly was today and they were lucky enough to perform in the Great Room in Faneuil Hall! This is where Erin was sworn in as a lawyer. 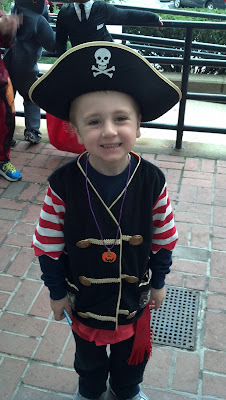 Last year the kids performed at the State House and the Peter Pan tent. Lucky Boston city kids. And to top it off the mayors office sent buses to take them back to school (they walked there) because the weather was so awful. 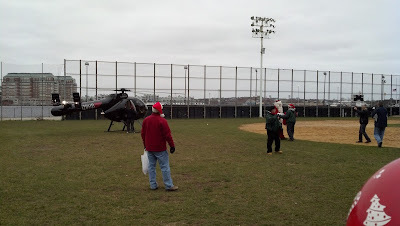 Only in the North End does Santa come by helicopter!! A 46 year old tradition here (well the parade has been happening for 46 years, I don't know about the helicopter part). 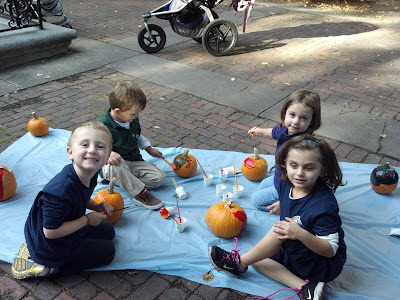 These are awful pictures, but I had to post them because I don't ever want my kids to forget the silly things like this that we get to enjoy in the city! 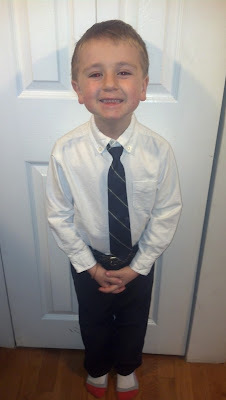 Happy 5th birthday to our buddy Brayden. Thanks for inviting Ang to celebrate with you. 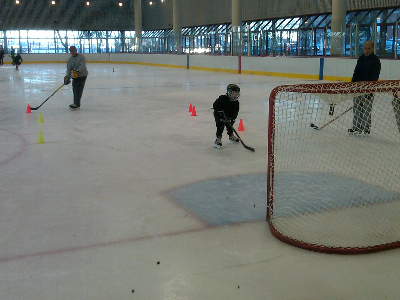 Today was Rich's first day of "real" hockey (well more real than before anyway). 7 am- 2 hours long.....he is the happiest tired boy out there! After hockey it was on to basketball and then a big plate of wings and nachos! As something to do on a Saturday night Julie and I took the kids to Jordan's furniture to run around. Yummy Fuddruckers for dinner and Richardson's ice cream for dessert. Then the jellybean bridge, giant Wally and the water show. Best furniture store around! 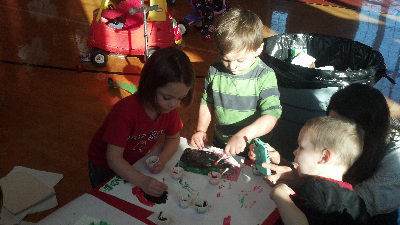 Angela's play group had a Christmas party. She loved dressing herself in red and green and ate so much sugar. 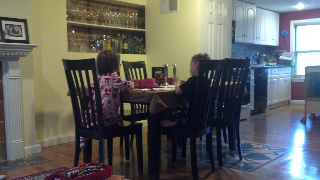 And she didn't leave her buddy JoJo's side! Although I should be cleaning, Christmas shopping, doing laundry or any one of a million things I chose instead to just hang with my baby girl! She is already not actually a baby and it makes me sad every day. Everything else will be there when I get home. 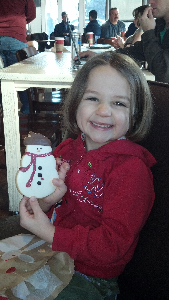 This snowman cookie (and Angela's smile) will not! One pretty lucky mom! Watch "Angela and her tap routine" on YouTubeAngela has never been into ballet or tap (although Rich loves a good dress up session!). I have asked her many times if she wants to take a class and she always says no. Says she is a boy not a girl and don't dare call her pretty (you can call her handsome!). Well she got her first pair of tap shoes and tutu (hand me downs from Emily and Gracie) and actually let me teach her a routine! It is adorable! Enjoy. 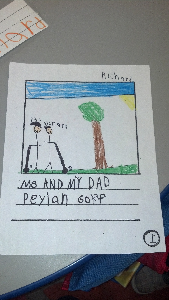 It seems Rich and his class are writing books at school. He showed me his today and I cried! It is SO good. All about him and Chris playing golf. I can't wait to see the finished product. I just love him and his little creative mind! Rich was invited to a cookie decorating party at his great friend Fineas' house. 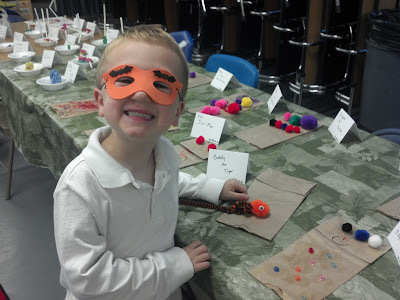 Some of his favorite friends from school were there as well! 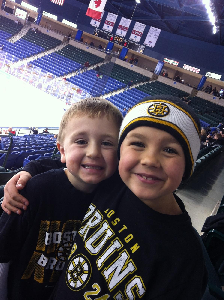 Rich was lucky enough to get invited to a Northeastern/Lowell hockey game with his bud Colton. It sounds like he ate everything they had at the snack bar so I may owe Kelley and Nick some money! We finally found a night to decorate the tree and the house for Christmas. Such a busy life we lead! My favorite part is that Chris does the lights on the tree. The worst part if you ask me. Every year he pours himself a stiff drink (what his Dad used to do when he was growing up - a brown bullet he called it) and gets to it. There is sometimes some swearing, but who can stay mad when your house is getting transformed into a winter wonderland? I can be the biggest scrooge (there is just so much to do at Christmas time!) but the smell of a fresh cut tree and the soft lights around the house makes everyone smile. And of course the kids think this is heaven. All the Christmas themed toys and books they forgot about from last year. AND they stop nagging us (see I can be a scrooge!). Hope everyone is enjoying the season! 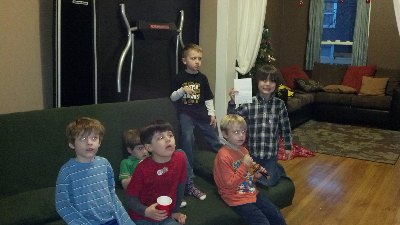 Santa will soon be here. This is the second year that I have taken Richie to the theater at Christmas. Last year we saw the Christmas Spectacular and this year The Grinch. We go with friends Maddie, Haley, Amy and their Moms. Richard and his women! 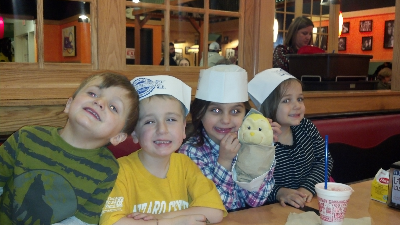 The kids love the special, fancy night out. Next year I wonder if Ang will be old enough to go. She loves her Daddy nights at home still. 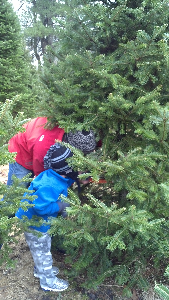 After our weekend in Freeport, Maine with friends for the Polar Express we went to cut down our tree. 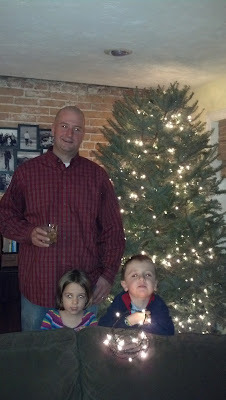 The kids just love this tradition and there is nothing better than a fresh cut Maine tree. 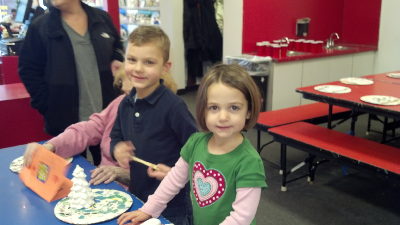 One of our oldest friends, Riley is turning 9 and had the best birthday party today. 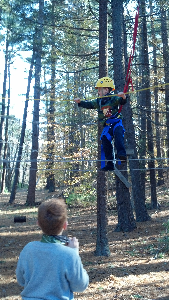 It was a ropes course in the woods. Both kids were psyched and so brave! Ang was the youngest to do the rope bridge and Rich the youngest to do the 6 foot rope. The harnesses barely fit my skinny minis but that didn't stop them! Happy birthday to our bud Riley. I can remember snuggling him when he was just a tiny newborn. Angela playing photographer. 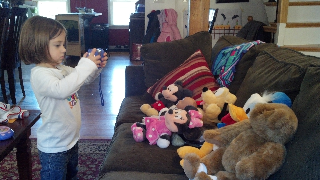 She did a photo shoot with each of her stuffed animals! Sometimes peace.....and quiet does exist! Regina is lying in front of the fireplace and I have a cup of coffee. Peace, in at least one house, right now. Richie and his soccer team have REALLY enjoyed and improved this year. It is sort of amazing how different a year is. Last year they picked flowers and ran from the ball. This year they have won all but one game. They are aggressive (almost too much sometimes!) and really listen to the coach. I will have to take some video next week. 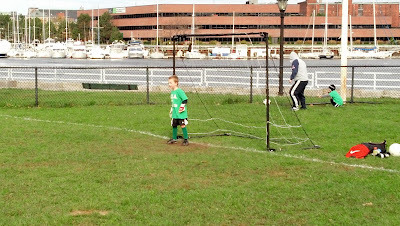 Here is a picture of Richie playing goalie for the first time. He let in one goal, but then made a big save! 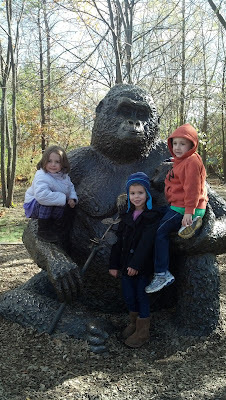 We had an amazing weekend with family from New Jersey! They were here for a bad reason (because they had no power due to hurricane Sandy), but I think we were able to help them forget about that for at least a little while! We went to the zoo and then down to Erin and Matt's house. We hope they will come back soon! 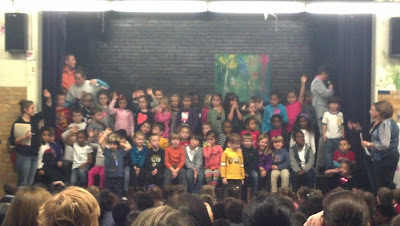 All of the Eliot K2 kids singing Chicka Chicka Boom Boom. Super cute although you can barely tell from my horrible phone pictures and video. I WILL start remembering to take my camera to these things! Also, all of the kids get awards at each assembly. Richie got something about making great Lego structures. Not sure if that means his work is lacking or he already excels......I think I better talk to Ms. Hutchins!